There are more than 12,000 different species of ants in the entire world, but only a few of them actually invade into our home. Rest all remain in forest or non-populated areas which is a good thing as well. The one that remain in non-populated area may have highly dangerous toxins and some of them can actually kill people also. Well, we are not going to talk about those other ants here, but we will talk about the way to get rid of ants from your home. There are some simple tips that you can actually do to prevent ants invasion in your home and here are 8 ways to get rid of ants from your home. Block entrance area: This is the first thing that you need to do to prevent ants in your home. You can do all the other things but if you don’t seal of their entrain points, then they will come back again and you won’t be able to do anything in that. So, when you see any kind of cracks or seal break in your home then you should seal it off with right kind of solutions. You can either use plaster of Paris or you can use putty or other things depending on your requirement or choice. The only thing you must remember that you seal off the entrance area for ants and you seal it for good. Use soapy water: When you clean your home flooring, then you should use soapy water for that. With soapy water you will not only kill the ants, but you can clean their track as well. This method may sound foolish, but it actually works. 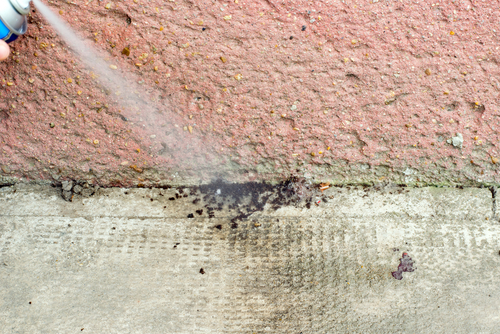 All the ants leave a chemical trail behind them and other ants follow that trail. When you clean that trail, then they get confused and they do not enter into your home unless they find some other path for that. Make barriers: If you are certain that ants are coming outside of your home and you cannot seal that area, then you can make a barrier over there. To make this barrier, you can use some products that ants don’t like. For example, you can take pickle and you can make a border with it. 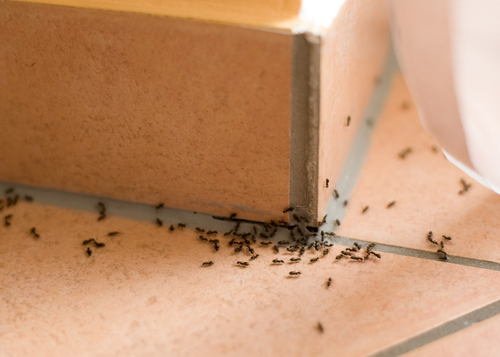 Ants will not cross it in any condition and you can block them entering your home. If that is not possible then there are certain chocks available in the market that you can try for this particular requirement and you can have good outcome with that as well in really amazing manner. You can use baits: To keep ants away from your home, you can also create a bait and you can use that to keep them out. Sometime straight forward methods may not work well for you and in that situation you can simply take some sweet food like sugar or anything similar to this and you can put it in a plate. After that you can put it outside of your home in an area where usually ants come. They will get distracted with this bait and then they won’t enter into your home. So, you will be able to have a safe home free from all kind of ants. Have good sanitation: IF you don’t have a good sanitation practice in your home, then also you can see a lot of ants in your home. When you see any kind of spill in your home, then make sure you clean it as soon as possible. Also, you should do regular cleaning to avoid any kind of ants attack in your home. If you spill any kind of sweet food or liquid, then you should not wait for the cleaning time, but you should do the cleaning right away to make sure you get nothing but the best outcome from it in easiest possible way. Sprinkle flour: Some people do not like to use chemical solution nor they want to kill the ants due to their own philosophy. If that is the case, then you can sprinkle some flour at the nest of the ants. 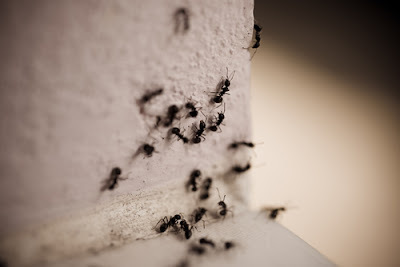 Ants do not like the smell of flour and thanks to its repellent smell, they will not cross that particular area and it will be a safe solution for you. The best thing of this method is that it will not harm anyone and you will not have to worry about the chemical effects as well with these method. Use chemicals: Sometime other solutions may not work effectively for you and you may wonder what to do. Thankfully there are certain chemicals available in the market that can help you in this situation as well. These chemicals work really great against the ants and gives no harmful effects to you as well. You only need to sprinkle these chemical based cleaning solution at the nest of ants and you should be able to get rid of same without any issue. In most of the situation you get good result with it. And if they are not getting removed, then you should not try anything else other than calling an expert for ants removal. Call an expert: Calling an expert is defiantly a good idea for this particular requirement. Sometime you may fail to get any success in this regard with all of your efforts. In that situation calling some experts is the only recommended thing for you. When you call experts for ants extermination, make sure you ask them to use only those chemicals that are safe for your family and pets. Also, when you call them then ask for long terms results because you would not want to have the same kind of issues again and again in your home in any situation. Along with these methods there may be several other methods as well for this solution. However, if you cannot get a solution by above 8 methods, then you should call only some other expert for that instead of trying more solutions. I am saying this because above methods are best and highly used by experts and if those are not working then only strong chemicals will work and that should get handled only by experts.